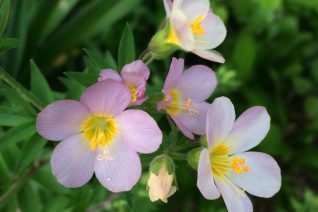 Our native pink Jacob’s Ladder is a great plant for gardens. Hailing from valleys adjacent to the Cascades the finely divided foliage of this clumping perennial is attractivw but enhanced when the clusters of very pretty flowers open the palest pink aging to lavender over several days. Full sun to part shade in rich moisture retentive soil. To 28″ tall and somewhat spreading. Blooms for an extended period from April to June. Summer drought will bring dormancy. Mixes well at the margins of woodlands or the front of perennial borders. A really pretty native perennial. Adaptable to heavy clay soils. Soars in rich, amended soils and can be quite a bit larger than I listed. Oregon native plant.